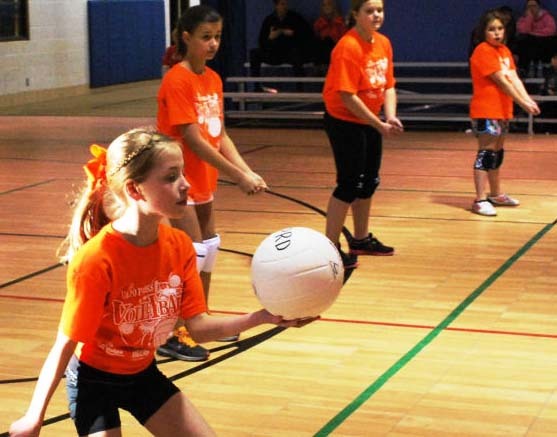 Volleyball for kids About Volleyball The game of volleyball originates in United States of America(USA). Willaim G. Morgan introduced the game in 1895. Previously, the name of the game was mintonet and it would be played with an inflated ruber bladder. In 1947 the International Volleyball Federation (FIV) was formed in Paris with only 13 countries. The game is popular in Bangladesh and is played everywhere. Keeping in line with FIV, Bangladesh Volleyball Federation was established in 1972. The game of volleyball originates in United States of America(USA). Willaim G. Morgan introduced the game in 1895. Previously, the name of the game was mintonet and it would be played with an inflated ruber bladder. In 1947 the International Volleyball Federation (FIV) was formed in Paris with only 13 countries. The game is popular in Bangladesh and is played everywhere. Keeping in line with FIV, Bangladesh Volleyball Federation was established in 1972. 1. The length and breadth of the volleyball court is 18 meter and 9 meters respectively. Every line of the court is 5cm wide. The court has two sidelines and two end lines. These liners are included in the measurement of the court. 2. The court is divided into two halves by midline. Each half has one attacking line which is 3 meters away from the midline. 3. The area beyond the end line in each half is said as a service area. 4. Volleyball net measuring 1 meter × 9.50 meter is fixed at the two round shaped poles. These poles are set at the two sides of the court following the midline and it will be around 1 meter away from the court. The height of the poles from the ground will be 2.55 meter. The height of the net from the ground will 2.43 meter and 2.24 meter for men and women respectively. The white tapes measuring 1m × 5 cm each are fixed with the net following over the sidelines. Two stands are set vertically at the outer edge of the taps. The stand is 1.80 m long and 10mm broad. These stands are called an antenna. The upper portion of the antenna will be 80 cm. above the net. The antenna will be painted white and red alternatively. 5. A team is formed with 12 players. Only 6 players take part in the game. Maximum six numbers of players can be substituted. 6. The position of the players at the start of the game will be 3 in the front row and 3 in the back row. 7. The team wining toss will decide to choose either service or court. 8. A player in the service zone will lift the ball in the air and will hit it by one hand with the object of sending the ball to the opponent’s court. This is called service. The server can enter the court just after serving the ball. 9. When the receiving team will get the opportunity to serve, the players of that team will rotate anti-clockwise in their court. This is called rotation system. 10. The team which wins 3 sets out of 5 will be declared as winners. 11. During the course of the game, a ball can be touched 3 times at the maximum when sending it to the opponent’s court. But if the ball is touched at the time of blocking, this will not be counted as one of the touches of 3 times. 12. A player can not touch the ball twice successively. 13. The ball can be hit by any part of the body. 14. If the ball touches the net after the service, it will be counted as a fair one. 15. When the ball is in the area of the opponent’s court, it cannot be hit over the net. 16. The players of the back court cannot come forward to attack the ball over the net and they will not be allowed to participate in blocking. 17. The team which commits a fault, will lose the service and the opponent’s team will win the service and a point will be added to their score. the opponent. But if the score is level at 14 points each, the game will be continuing until 2 points lead are earned by a team. a. For a right-hander, he will put his left foot in front and right foot at the rear. He will bend his right knee and will keep his body weight on the right foot. b. The ball will be placed on the left palm. His right hand will be drawn back and straightened to make a quick swing. c. The ball will be lifted up a bit in the air and it will be hit with the right palm or its upper part. d. After hitting the ball, he is to lean forward for a follow through and in doing so, he will take his body weight to his front foot i.e. left foot. will be high in the air. a. Before serving the ball, a player will stand in the service zone with his legs apart. He will keep his body weight on his two feet. b. For a right-hander, the ball will be placed in her left palm and it will throw up word in a height of 1 meter in the air. c. When the ball falls down, the ball will be hit hard with the right hand. The ball is passed over the head by two hands. a. While passing, the ball is to be touched with the fingers. The fingers will be spreaded and the ball will touch its knuckles. b. The elbows will be raised above the shoulders so that the ball can be played in front of the forehead. c. Knees are to be bent and the weight of the body will be on two feet with equal proportion. He is to lean forward a little to make the pass. d. The ball will be touched on its back and will be pushed upward for passing in doing so, his bent knee will be straightened to get a thrust. a. Excepting the thumb finger, the fingers of one hand will join together and will hold the fingers of the other hand. The two thumb fingers will lay side by side. b. The hands from the elbow to the wrist will also lay side by side. c. The waist will go down by bending the knees and will draw the body under the ball.